Public Address System is a recorded speech composed for, and played over, loudspeaker. Engaging with forms and scales of ‘public address’ from speech-making to public service announcements, the content refers back to the particular medium through which it is played, and reconfigures the expected loudspeaker broadcasts of ‘address’ and ‘announcement’ to test what we might assume to be the traditional subject matter, volume or intelligibility of the PA system’s transmission. 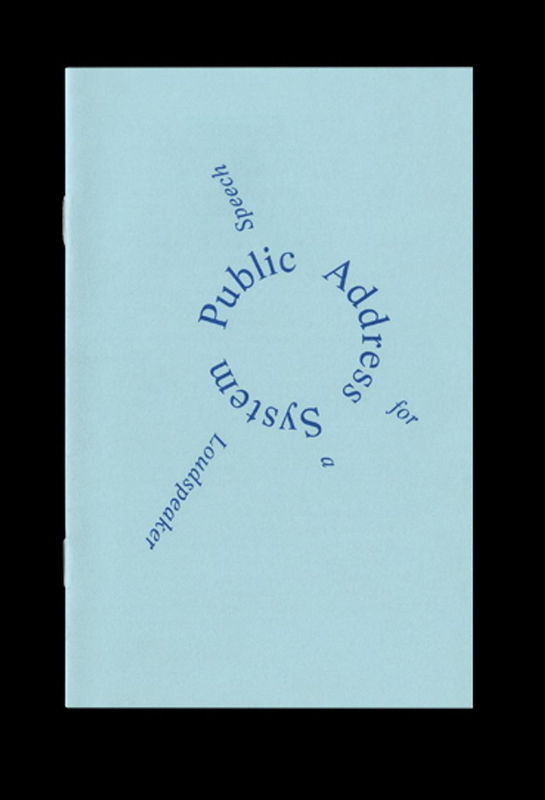 Played in three parts - at the beginning, middle and end of each day at the fair as entrance, interval and exit ‘music’ - each broadcast sonically marked the duration of the day, drawing attention to the changing activity of the space and the different ‘publics’ it plays to. Through thinking out loud about what kind of public is being addressed in the context of the art fair, and what kind of past publics haunt this space and its airwaves, Public Address System concentrates on the body of people being addressed, or hearing the sound, as a distinct public – a public whose temporary gathering and dispersal at Olympia is marked by the rhythm and words of the three-part address. This sound file, annotating the chapter Far Stretch, comprises and compares both a field-recorded extract of Public Address System played through the loudspeaker system at Olympia and the same extract in its original form.